It has taken me quite some time to finally put this review into coherent words, as I have had incredibly mixed feelings about The Other Einstein. 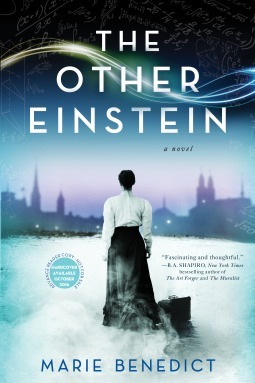 This book focuses on Mileva Maric, the often under-appreciated wife of Albert Einstein. Maric was an intelligent woman who excelled in the same area of studies as Einstein, and there is unsubstantiated claims and beliefs that she is behind some of the work commonly attributed to Einstein. These claims are not proven, and the author even makes sure to note that this book is indeed fiction and not a true account. The overall notion and basic elements of this story are all rooted in fact, of course, but there are liberties taken, as is the case in any historical fiction novel. First, I would like to discuss the two main characters, Mileva and Einstein. I love that Benedict took the time, effort, and interest in Mileva Maric to write this book in the first place, as Mileva appears to be an interesting and captivating character that I would truly like to know more about. Where Benedict falls short, however, is her development of Maric's character. She felt very one-dimensional and lacked the amount of depth I hoped for and many possible dynamic features. I was disappointed in how she often let Einstein sort of walk over her, and although I understand that this may have been much like the true story, it left me with very little to enjoy or root for. Contrarily, this is like close to the situation that Mileva dealt with, which adds a certain ring of authenticity that is hard to swallow. Additionally, I had another slight issue regarding the relationship between Einstein and Maric, which felt extremely unbalanced and one-sided. To begin, The Other Einstein seems rather anti-Einstein in nature, and Benedict failed to show us many of the endearing qualities that likely drew Mileva to Einstein in the first place. All I saw was an arrogant man who did not treat his wife with the respect she deserved - which is true - but unfortunately I did not understand her interest in him even before they were married. The Other Einstein also contains many chapters that suddenly jump in time to a few months or even years later, and I often felt like I was missing out on things. This made the story itself feel a bit disjointed and thus made me feel somewhat disconnected to the story and the characters. On a brighter note, something that I really loved throughout this book was Benedict's writing style. She writes with meaningful sentences that easily convey depth and emotion in an effortless manner. Her writing is also done in a way that I felt matched the often bleak and unhappy atmosphere and emotions that Maric was feeling, which created a wonderful overall tone. It is obvious the Benedict is a talented writer and certainly knows how to tell a story. I truly appreciated how much effort, research, and heart went into the creation of this story. Overall, I am giving The Other Einstein three-and-a-half stars. While this book did not particularly engage me, I still appreciated Benedict's attempt to shed light on the lesser known Einstein and her own struggles and accomplishments. I enjoyed this peak into the time period and the world in which these historical figures lived, and I have seen many other readers who have fallen in love with this book. I will certainly be recommending this one to many people! And later this month/early November I will have a guest post written by the author, Marie Benedict, along with a giveaway for The Other Einstein, so stay tuned!